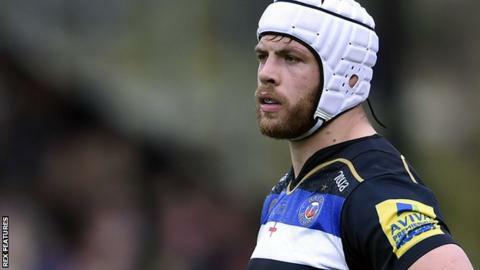 Bath lock Dave Attwood says the "tide has turned" for the club as they prepare to face Saracens on Friday. Last year's Premiership play-off finalists are ninth in the table, 14 points below the top four. But last weekend's 17-12 victory over local rivals Gloucester was their third in four matches. "The momentum that will give us will be huge. There is plenty for us to play for. There are no dead rubbers," England lock Attwood told BBC Somerset. "It was a great result for us last weekend. It was quite an emotional, physical game. "It's nice that the tide has turned a little bit in terms of what we're doing on the field. We certainly look like a more competent team running around." Attwood has been sidelined since undergoing neck surgery in January, an injury which saw him miss the duration of England's successful Six Nations campaign. But he has now completed his rehab and hopes to be included in the squad to play leaders Saracens at The Rec. "I slipped a disc in my neck," he explained. "We had surgery to fix it. This was a strange one. "Great to be back. It's been quite a frustrating 12 weeks away being injured, being sat on the sidelines. "There is no substitute for running around on a rugby pitch, hitting the scrums, tackles and getting back in the defensive line." Attwood was not selected by former England head coach Stuart Lancaster for the 2015 World Cup and then had to watch from the sidelines as Eddie Jones' side completed a first Grand Slam in 13 years. "The guys went really well in the Six Nations," Attwood continued. "That's tremendous for England and great for English rugby. "It was a great way to get back on track after a disappointing World Cup. "Obviously this injury has affected my potential involvement again - whether I would have been involved or not (in the Six Nations), I can't say."